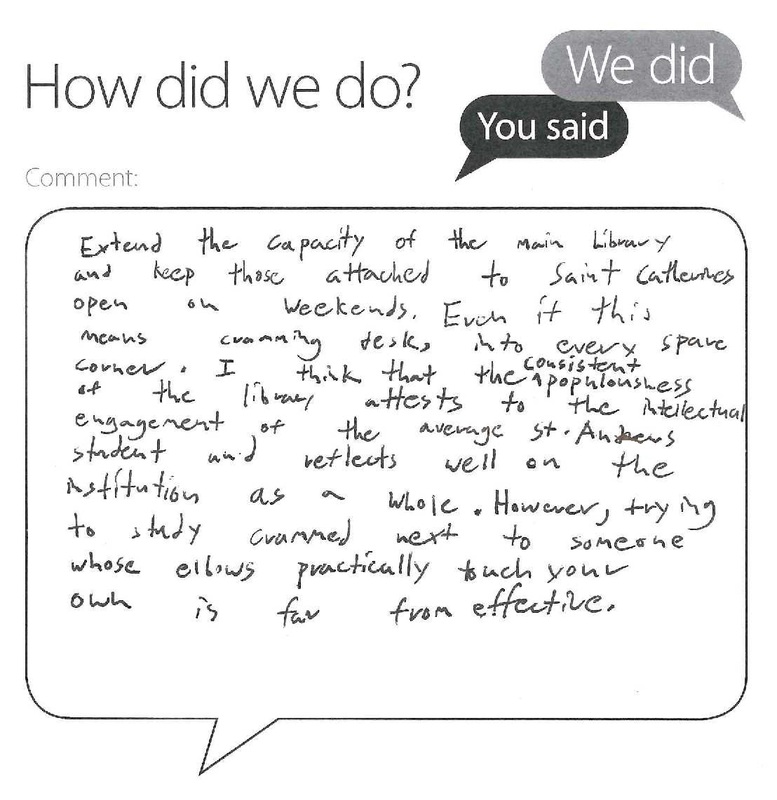 Thanks for your comments card on Sunday of this week – we always appreciate getting feedback from our users. I quite agree – we clearly don’t have enough study space in the Main Library to cope with the demands placed on it and we would love to have more. You may be aware that the University spent £7m refurbishing the building 6 years ago and by doing so, increased study seats by around 400. We achieved this by relocating staff and collections to other areas or sites. Since then, the building has become busier and busier and despite our opening hours being increased significantly in recent years, the pressure is still on the building throughout semester. The University does intend to redevelop Level 1 (the sub-basement) within the next few years once we have relocated the collections and staff currently accommodated there to the new Eden Campus at Guardbridge. The Eden Campus facilities are not yet complete and until they are, we can’t start any further work in this building. The planned development of Level 1 around 2019/2020 will introduce an additional 350 study seats but I appreciate that is some time away. Until then, we will continue to do what we can and I am actually in discussions this week with colleagues elsewhere in the University to help promote the availability of other study facilities already open to students. For example, the Gateway lower ground area has 60 study seats and is open 9am-9.45pm seven days a week for all students but I suspect many students are unfamiliar with its existence. You have mentioned Saint Catherine’s and I’m assuming you mean St Mary’s. We are actually running a trial of extended hours there this semester (information at https://www.st-andrews.ac.uk/libraryblog/2017/10/extended-opening-for-st-marys-and-king-james-library/) which means we are opening until 7.45pm Monday to Friday rather than closing at 5pm. We are looking to open at weekends during the Christmas exam diet but this would require additional funding for staffing. We are also looking to increase access to the JF Allen Library on the North Haugh and have also allowed PG Taught students into the Martyrs Kirk Library on a full time basis since September. It only has 40 seats but this allowance should divert some traffic from the Main Library. I hope this helps explain what we have done, are trying to do now and hope to do in the future to improve this important aspect of the student experience.